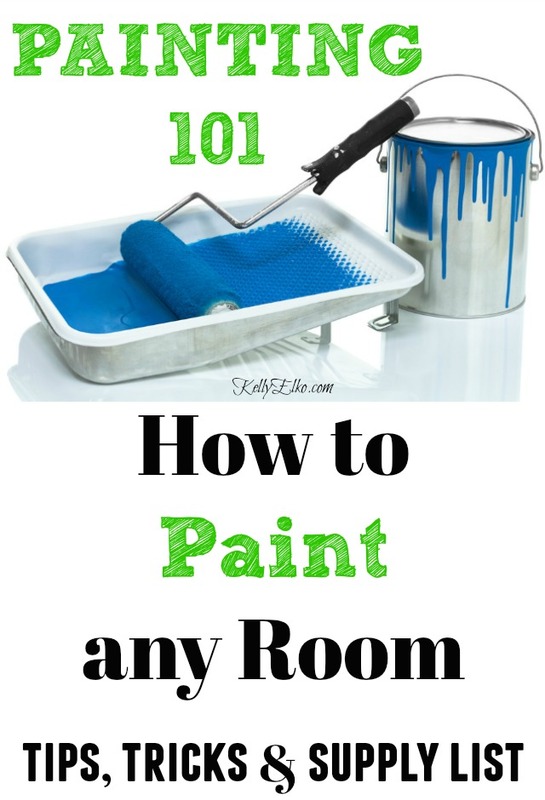 Three houses and hundreds of gallons of paint later, I’m sharing everything I know about how to paint rooms. It’s all about the prep and when you prep correctly, painting is a breeze. Remember, most of these supplies can be used over and over in multiple rooms. I’ve provided affiliate links so you can shop my favorite painting supplies. Tip: This Inexpensive Painting Kit has everything you need to get started including different size rollers and tray. Don’t let dust bunnies or grease spots ruin the finish. Wipe down walls with clean cloths then put a little bit of mild dishwashing soap on a sponge and wipe down walls. Rinse with water. Tip: If your walls aren’t that dirty, just wipe down with cotton cloths or old t-shirts. Repair Holes and Imperfections – Use this Wall Repair Kit or spackling compound and sandpaper for a smooth finish. Clear Room – Put large furniture in center of room and cover with tarps or Plastic Drop Cloths. Put small accessories and breakables in another room. Tape – If you are just painting walls, use Painter’s Tape on trim, windows and door frames and around lighting if you are painting the ceiling. 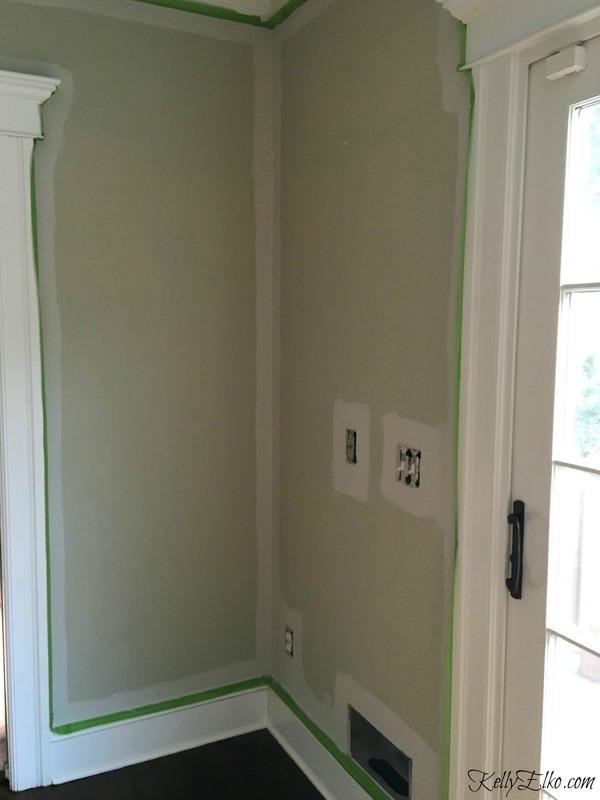 If you are also painting trim, save taping until you are done painting walls. When paint is dry, tape where the trim meets the wall and use a Good Quality 2 Inch Angled Paintbrush. Remove – unscrew all outlet and vent covers. Tip: I like painting outlet covers the same color as my walls so they don’t stick out like sore thumbs. Just lay them all out on a piece of newspaper and apply two coats letting dry between coats. Protect – Cover floors and furniture with plastic or fabric drop cloths. 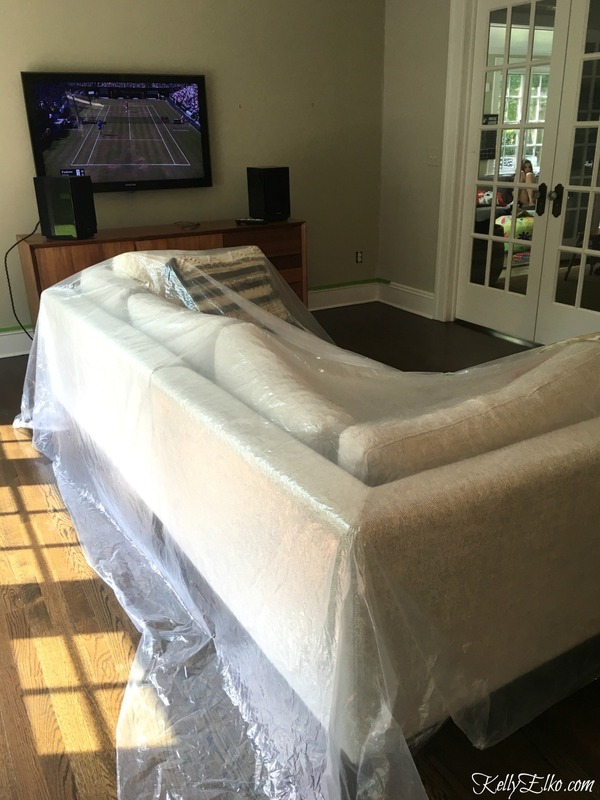 You can move the drop cloth as you move around the room. To Prime or Not to Prime – Use a good quality primer if your walls are stained or badly damaged or you are changing drastically changing colors (especially if you are going from dark to light). Have the paint store add color tint to white primer if you plan on painting a dark color. It takes about one gallon of paint to cover approximately 350 square feet. Give the dimensions of your room (length, width and height) to the folks at the paint store and they will be able to tell you how much paint you will need. Bathrooms and Kitchens – eggshell (easy to clean). Other rooms – I prefer flat paint because it doesn’t highlight imperfections (the shinier the paint, the more noticeable imperfections) and touch ups are easier. I can’t stress this enough – quality is key. I like this Two Inch Angled Paintbrush to paint all of the areas where you taped and where a roller won’t reach as well as all corners of the room. Cared for properly, the paint brush should last a very long time. Paint the ceiling first (you can’t go wrong with flat ceiling white), walls then trim. Prime if necessary and let dry then paint using the W technique (instead of up and down). With a roller, start at the corner of a wall and roll on a three by three foot W pattern, then fill it in without lifting the roller. Continue in sections until you’re finished with each wall. Go back and repeat the process for the second coat – cut in with the angled paintbrush then roll on the paint. Two coats should be sufficient but darker colors may need more. As soon as you finish, remove painter’s tape. Wait until the next day to put outlet covers on. Clean Paintbrushes, rollers and trays – mild dish soap and water is all you need to remove latex paint. 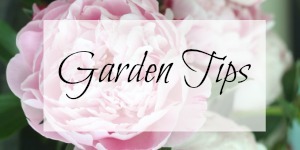 Make sure to clean brushes immediately after using (and each day if you are painting over several days). It’s definitely easier with two doing the job. My husband and I both tape then I cut in and he follows me around the room with the roller. Don’t let the supply list intimidate you. Most of these can be reused when it’s time to paint another room. All that is left to do now is stand back and admire your work and pat yourself on the back for all the money you saved by not having to paint. My family room after a fresh paint job in Agreeable Gray by Sherwin Williams. 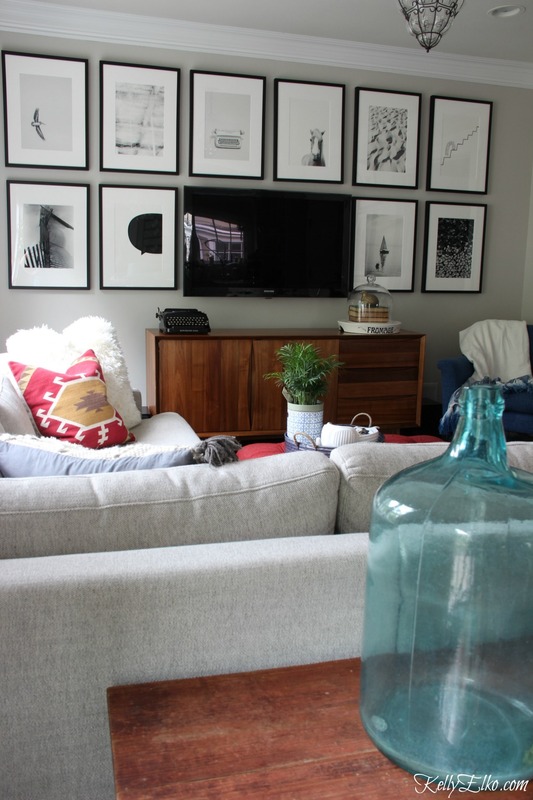 See more of my family room makeover here. I love the paint color and all the tips thanks. 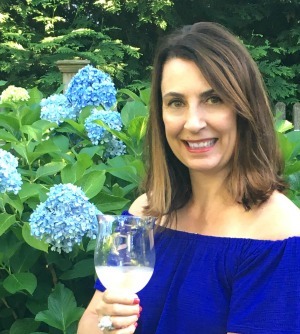 Thanks Marlene – I’ve been on a mission to repaint my entire first floor! My arms hurt!! Thank you for these wonderful and all so needed tips. When I help paint the basement, I know how to get that clean professional look, thanks to you.